In an effort to make things easy, and maybe even fun, we created APK Mirror. 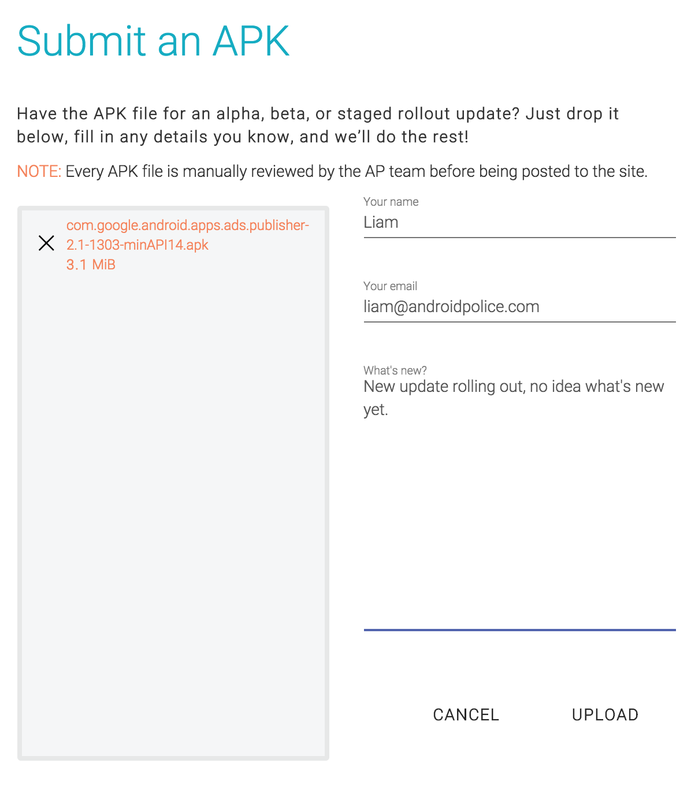 Over the past several months, we've been working to build a smooth, reliable, trust-worthy site to host the downloads users love and keep the whole experience in the AP family. After a soft-launch, we thought it'd be a good idea to give APK Mirror a more formal introduction, for those who might not have explored it yet. 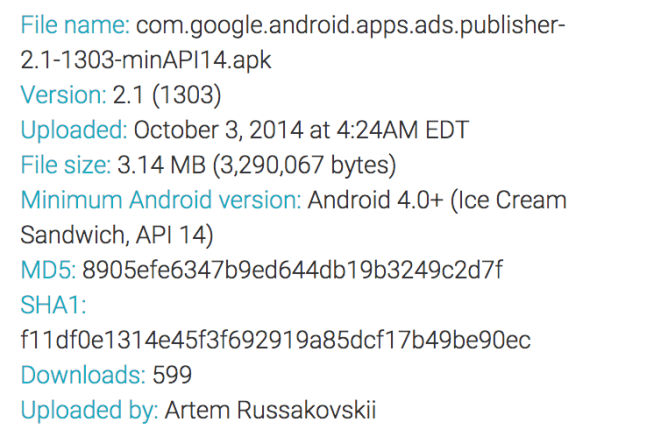 When a new APK hits, the most important thing to those looking for a download is that they get it fast. 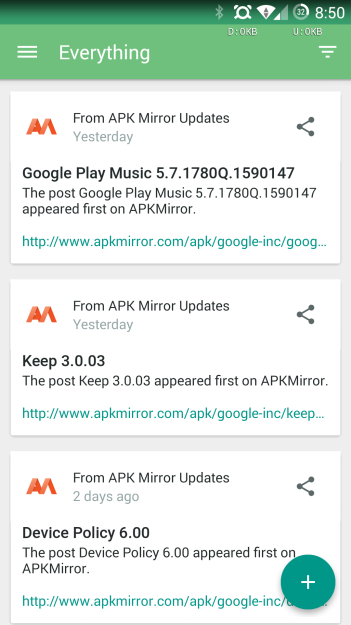 We've made sure that APK Mirror is quick and snappy, and responds to whatever device you're visiting from. The site was fast to begin with, but after Google's new Calendar app hit, we ran into some serious traffic that ate right through download speeds, so further improvements were made. Moving forward, users should be able to enjoy consistently smooth downloading. The site also stays out of your way. 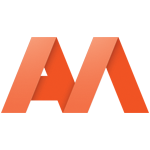 It is ad supported, but we don't use popups, pop-unders, or any other nasty tricks or intrusive advertising. 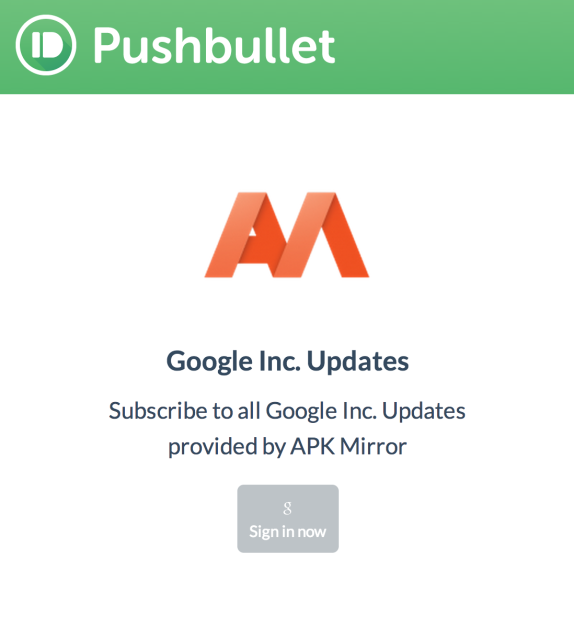 APK Mirror also has Pushbullet integration - if you want to keep an eye out (automatically) for new APKs, Pushbullet can do all the heavy lifting for you. Users can subscribe at a variety of levels including all new APKs, all APKs from a certain developer, or just APKs for a specific app of their choosing. As for actually using the site? It's easy. We want to make sure that users always get to what they want in just a few clicks, so Google apps (the most popular category) are presented on the front page, underneath the latest uploads. We also keep a list of the most popular downloads in a side-bar so you won't miss something exciting. 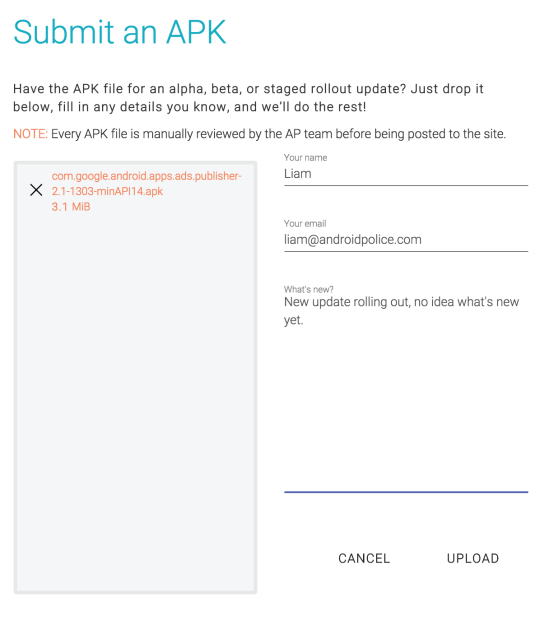 In most places where app listings appear, users can also get quick info about the download, and a link to the AP post discussing the update. To upload an APK for the community, just hit the FAB in the upper right corner (or if you're on mobile, the cloud icon). A form will appear, into which you can drag files, tell us what's new, and hit upload. When all is clear, you can dismiss the dialog and go back to business. 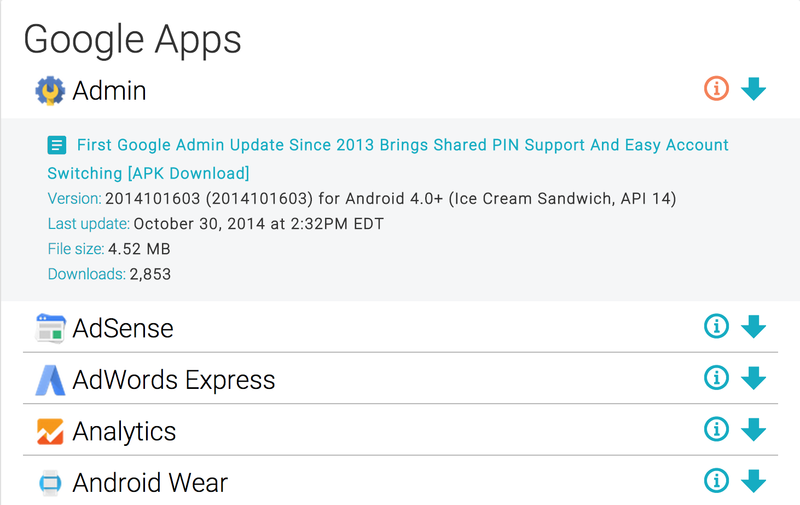 Once we've approved the APK, you'll get a quick note to confirm. If you're downloading, there's no need to worry whether you're grabbing the latest version of an app - we'll let you know. Every version of a given app is listed on its download page, providing quick access to the newest - or oldest - upload. Of course we're aware of the risks of running a site that provides downloads of user-uploaded content, particularly when that content will be installed on your device. 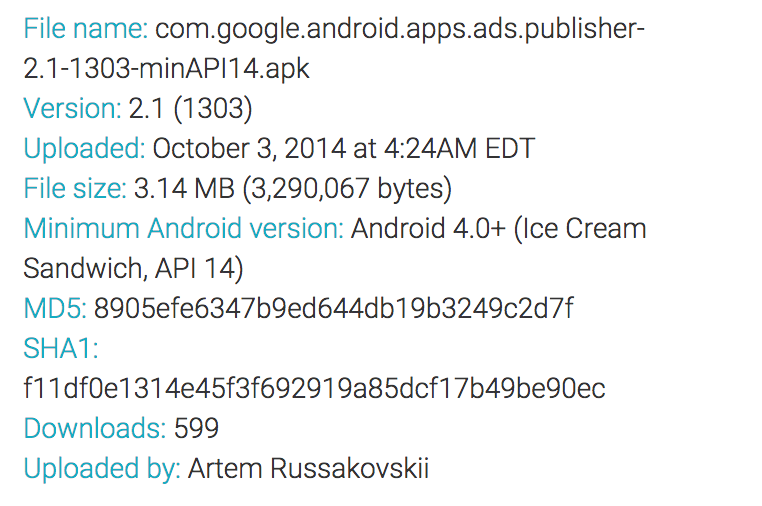 To keep things safe, AP staff checks each APK that's uploaded to make sure it's the real deal. To ensure there's not been any tampering, we even have an automatic signature check that will ensure the app's signature matches with the original. Additionally, the MD5 and SHA1 values are presented to the user explicitly (along with useful compatibility info), just in case a download goes wrong. For those interested in the details, there are a couple worth mentioning. For starters, APKM supports IPv6. And remember earlier when I said we made improvements to how the site handles traffic? Before the traffic spike I mentioned, APKM didn't use a CDN to deliver content to users. Since the spike however, we've activated CloudFlare for the site, which describes itself as "a reverse proxy" for its clients' sites, standing between the actual host and the user to act as a powerful CDN of its own. This means users shouldn't experience as many download drags during heavy traffic. Most importantly, we aren't done with APKM yet. Right now we've got the viable service out, and we will continue to iterate both on the design (I've got a lot of work to do!) and the functionality for the foreseeable future. In fact, we've just added another new feature today - the ability to see a complete list of recent uploads in reverse chronological order. There may or may not also be an APK Mirror app in the works. I can't give away any details of the proposed app yet, but it's under consideration, and I can say that - if it sees light - it'll have a thoughtful, well-rounded design and a great feature list. 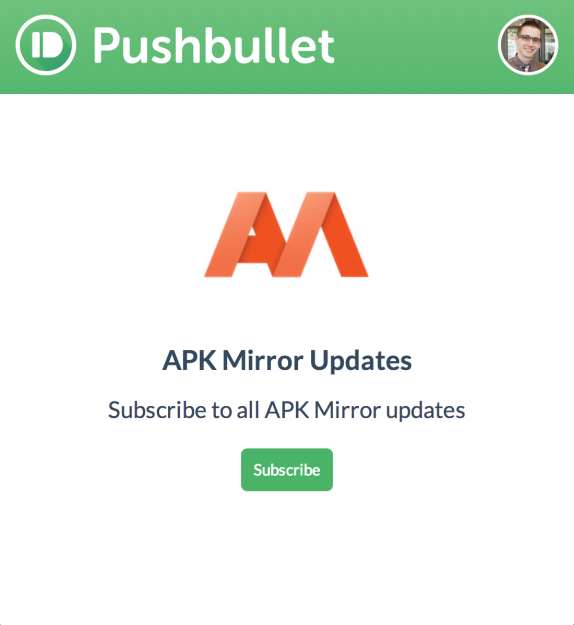 Here's looking forward to what's next for APK Mirror and Android Police! In the meantime, you can keep up to date by following APK Mirror on Facebook, Twitter, and Google+ or just head straight to the site.